I am proud to introduce my guest blogger Erin Hicks (one of my amazing hygienists ). She has decided to discuss this topic from a very personal perspective – please read and pass along to others. I wanted to write a blog about an important issue that can be difficult to talk about: smoking. Many of us either have personal experience with it or know someone who struggles with nicotine addiction. I battled it for years, and after countless attempts, I finally kicked the habit. I grew up in Indiana, just near the Kentucky border, where smoking is a huge part of the culture. Many friends and family members were smokers, and as a teenager I began smoking, too. In college, I tried to quit by taking the prescription drug Zyban. It worked for a couple of months, but then I started again. Starting college was perhaps more stressful for me than most. My father, who had been a smoker most of his life, passed away just two weeks after I got to school, after a long battle for his life. Smoking had most certainly contributed to his heart disease, and ultimately his death. Despite having such a strong motivation to quit, my nicotine addiction won out. As the years went on, I tried almost every way to quit that you could think of, including gum, patches, and going cold turkey. I quit so many times I lost count. Once I quit for nearly a year. Another time I managed to quit for a full 2 1/2 years. Many, many times I would quit for two or three days, or even a few weeks, only to find myself smoking again. Smokers often have a love-hate relationship with cigarettes, and I was no different. Cigarettes felt like an old friend to me… a great comfort at stressful times and an enjoyable part of any day. But I was a slave to them. What makes it so difficult to quit smoking is not the physical addiction alone, but the intense psychological addiction that goes with it. This is what many people who have never smoked can’t understand. I try to help them relate by saying that it’s not so different from the struggle to break (or make) any habit. Most people know how hard it can be to start flossing or to lose weight. It’s not that we don’t know what we should be doing for ourselves, but there’s a laundry list of other emotional and psychological issues that make it extremely difficult. For me, the struggle to quit smoking boiled down to this: I knew how and why to quit, but could I save myself from myself? Self-mastery seemed impossible, and no gum or patch could help me with that. Now that you know my story, I’m extremely happy to say that I’ve been a non-smoker for over five years now. For me, cold turkey was the method that worked the best over the years. The last time I started again, I had made the mistake of thinking I could have just one cigarette, the way a social smoker can, and found myself addicted again. 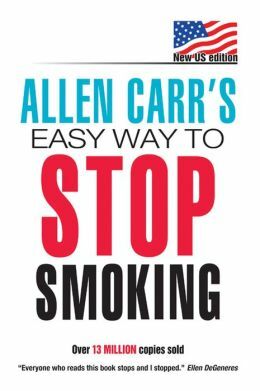 I was talking to a friend about it, and she mentioned a book that had helped her quit, called The Easy Way to Stop Smoking (written by Alan Carr.) I was super skeptical, but I found a used copy at the bookstore that cost less than a pack of cigarettes. I figured, why not? I was pleasantly surprised that the book really worked for me. And I haven’t started smoking since reading it over five years ago. If the subject comes up, I tell everyone I know about this book. I make sure to tell them to give it a fair shake and read it the whole way through. The author’s writing style is a bit…..different. I wouldn’t call it a fun read, but it was very effective. No matter what works for someone, the important thing is that they KEEP TRYING. I’ve heard that it’s very normal for smokers to have a lot of failed attempts, and that was definitely my experience. I’m just so thankful that I kept at it, and that I’m finally a non-smoker. My quality of life has gone up so much. I used to feel tired all the time, and I hated the way my lungs felt in the morning, even at my young age. I feel SO much better now. I have more energy, and a lot more money. Most importantly, I don’t feel like I’m at the mercy of this terrible addiction anymore. I’ll never be smoker again, and I finally feel confident saying that.